A chemical company in Innsmouth, Massachusetts is illegally dumping toxic waste by paying two men to load their truck full of the muck and pouring it out in the hilltowns of the state. The factory is also illegally burning waste, causing deadly dumes to rise out of their chimneys. An owl and a crow accidentally fly through the lethal steam and fall into the smokestack. Inside the facilities, a factory foreman trips over the truckers’ cat and angrily tosses it into a vat of waste. All three animals are pumped out of the factory via a drainage pipe and arise in new mutated form – with a vendetta against humanity. One year later, April is driving to Boston to write a story about toxic waste when her rental car gets a flat tire. O’Neil is in the middle of nowhere, but notices that Innsmouth should be within walking distance. After a very long trek, April is found by an Innsmouth police officer, who takes her to the station. The sheriff tells April that he’ll have her car repaired, in th emeantime, she can grab a bite to eat at the local diner. As soon as April leaves, the lawman calls the restaurant and tells the waitress to “take care” of O’Neil. The woman slips something into the reporter’s milkshake. When April gets up to leave the diner, she suddenly feels very ill and falls to her knees in tear-inducing pain. A teenage girl named Beth Ann shows up and helps April stand up, telling her that they have to go, before “they” show up. O’Neil is suspcious and heads off on her own, only to be grabbed by the sheriff, who tells her that she won’t be permitted to leave. April runs off and soon has the entire town chasing her in eerie silence. O’Neil manages to give her pursuers the slip and makes a call to the TMNT. Mikey answers the phone and thinks that it’s a prank. As he hangs up, we see that April has been snatched out of the phone booth. Master Splinter asks Mike who called, and he states that it was a prank asking for April. The guys remind him that no one knows that they’re friends with the reporter and only April knows their phone number – so it had to be O’Neil on the phone! 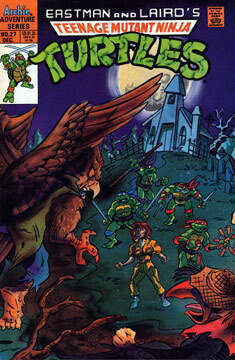 Mikey slaps his forehead in disgust as the TMNT pile into their van and race out to save April. The Turtles make it to Innsmouth and find it quiet – oddly, people are walking the streets like zombies, taking no notice of the mutant teens. Beth Ann arrives and leads our heroes to an old house where April has been taken. The Turtle teens break into the abode just in time to stop the cat, owl and crow mutants from forcing April to drink some toxic waste. Raph sends the evil mutants flying with a kick and a battle breaks out. The TMNT vanquish their foes with ease, sending them flying out of a window. Mike apologizes to April for thinking her call was a prank, but the reporter is so thankful to see her friends that she doesn’t mind. After the cheerful reunion, Beth Ann points out that the bad guys have flown the coop. One week later, the factory has been closed down. April reports to the police chief that the mutants were created by illegal toxic waste. The three had been adding the same waste to the townspeople’s food and water supplies, which put them into a zombie-like state and allowed the mutants to control them. The lawman thanks April for her help and April says goodbye to Beth Ann. As April rides off in the Turtle van, we see the three shadowy forms of the evil mutants watching our heroes depart. Contains an additonal five page April O’Neil story entitled “The White Ninja” by Dean Clarrain and Garrett Ho.